PLUSCO 315 Clear External Pipe Coating is a clear coating, which will dry to a glossy mill type coating on Oil Country Tubulars. PLUSCO 315 Clear External Pipe Coating fast drying characteristics allow the user to maintain high production and when dry, will provide corrosion protection during storage. PLUSCO 315 Clear External Pipe Coating will allow easy inspection of existing stencils, color codes, or other markings, while the very slight amber tint will enhance the appearance of the pipe. 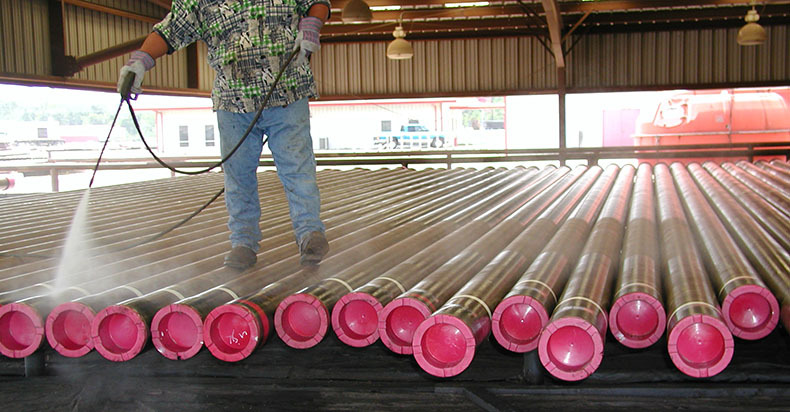 PLUSCO 315 Clear External Pipe Coating allows for easy identification of stencils or finish to the pipe surface, which is often desirable to resellers of tubular goods. Flammable liquid. DO NOT spray BELOW 45 °F. Do Not apply to salt or chemical damaged pipe without neutralizing. ID application may affect drift.